'Gotham' Recap Season 4, Episode 20 - "That Old Corpse"
This week’s Gotham gave us our first glimpse of Jeremiah’s transformation and possibly the first of many Batman – Joker showdowns.You ready? 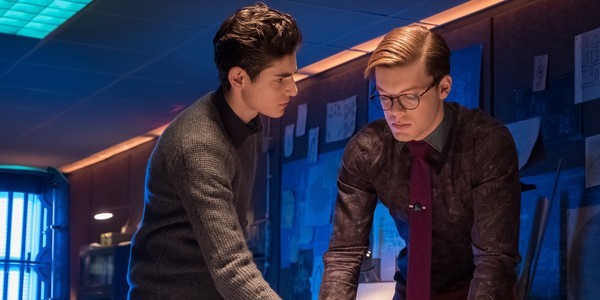 Throughout this episode of Gotham we see the after effects of Jerome’s death and his plan continue to fall into place. The episode really follows one big story line and begins with Jerome’s followers at his gravesite going through a makeshift funeral for Jerome. A woman dressed as a jester, who I can only presume to be Harley Quinn, pulls up and plays a recording of Jerome – or possibly Jeremiah pretending to be Jerome – ordering them to dig up his body. The next day at the GCPD Jim is clearly struggling with having Lee in lockup and not knowing what to do. This will soon be the least of his worries as he receives a tape from Jerome that is his last will and testament. He wants Jim to throw him a wake at the GCPD. To save Jim the trouble, Jerome has already gone ahead and organized the whole thing which Jim realizes when he looks outside and sees a mob of Jerome’s followers trying to ram the front doors of the precinct with Jerome’s coffin. Jim calls Wayne manor to warn Bruce and Alfred of what is happening and finds out that Bruce is at Jeremiah’s house discussing the energy project, which he thinks is a safe place for Bruce to be…little did he know what would be in store. Alfred decides to go retrieve Bruce and make sure he is okay, but before he can, mysterious figures break into Wayne Manor leading to a brawl ensuing. Having dealt with Jerome numerous times, Jim knows that he likes to use distractions to hide his real intentions and Jim thinks this raid on the GCPD is exactly one of those situations. He devises a plan to let Jerome’s people into the precinct while the officers escape out of the back and lock them in. The officers will surround the building and that leaves Jim free to be able to figure out what Jerome’s real target is. Jim’s plan works swimmingly and Jerome’s absent minded cronies enjoy hanging out inside the GCPD and causing mayhem. While they are contained, Jim decides to go to Jeremiah’s house to find him and Bruce. Unfortunately Bruce and Jeremiah had already left before Jim could arrive. Jeremiah had opened up to Bruce about being sprayed with Jerome’s gas and that he keeps hearing Jerome's voice. He also shows Bruce Jerome’s diary that Arkham had sent him after Jerome’s death. Bruce wants Jeremiah to stop focusing on Jerome, but Jeremiah is still paranoid that Jerome is out to get him. Alfred calls Bruce to pass along Jim’s warning and once Jeremiah gets wind of the message, his thoughts that Jerome is still alive and coming for him are validated. 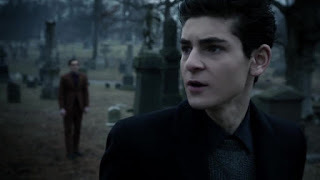 To try and alleviate these fears, Bruce suggests that they go to Jerome’s grave so Jeremiah can see for himself that Jerome is dead and buried. I have a feeling that if Bruce had known that Jerome’s people had dug him up, he probably wouldn’t have suggested this course of action. Riddler and Penguin both try and take advantage of the madness that is happening at the GCPD. Riddler is focused on rescuing Lee while Penguin and Butch want more information about Jerome’s plan. 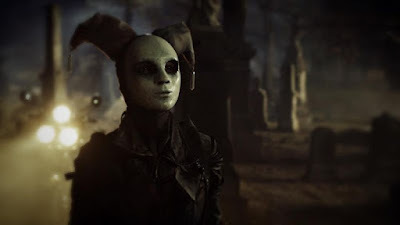 The Riddler dresses as a clown to try and fit in with Jerome’s crew and is able to sneak inside and find Lee – she may have found him first, but that’s neither here nor there. While the GCPD raids the facility to reestablish control, Lee and Riddler sneak out the back with gas masks on. Penguin and Butch are also successful and manage to kidnap one of Jerome’s men and torture him for answers. Jim gets to Jeremiah’s house and goes to his office. A video message from Jerome begins playing, distracting Jim long enough for the possible Harley Quinn to sneak up behind him and hold him at gunpoint. This doesn’t last long as Jim takes advantage of a split-second window and counter attacks. After a brief scuffle, Jim gets the better of her and knock hers out. He takes off her mask and sees that it is Ecco. Jim turns to watch Jerome reveal himself to actually be Jeremiah in the video, who needed to pretend to be Jerome to get his followers to set his plan in motion. Ecco manages to sneak out of the office right when Jeremiah lets Jim know that the generator in the office is actually a bomb. Jim manages to get out of the office before the bomb explodes, but did he get far enough away to ensure his safety? When Bruce and Jeremiah get to the cemetery, Jeremiah is horrified to see an empty gravesite which in his mind continues to solidify his worst fears and he runs away. Bruce chases Jeremiah into a mausoleum where we see the first showdown between Batman and the Joker. 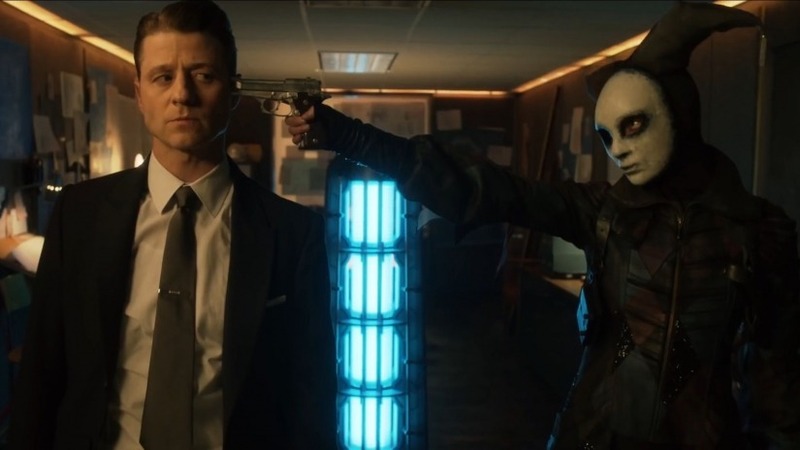 Jeremiah pulls out a gun and claims that Jerome must have taken Bruce’s face and he is still really Jerome. He takes Bruce back to Jerome’s gravesite at gunpoint, where they see Jerome’s body propped up on the side of the grave. This isn’t enough to convince Jeremiah of Bruce’s innocence and he pulls out a knife to try and cut Bruce’s face off. They begin fighting, but this is interrupted by Jerome’s followers arriving and chanting about Jerome’s victories. Jeremiah takes exception to this and wipes away the makeup from his face revealing some cosmetic issues that the gas caused. He has the bleached white skin of the Joker and his eyes have changed. To Bruce’s horror, Jeremiah pledges to outdue all of Jerome’s plans that are laid out in his diary. He tells Bruce that all of the generators that Jeremiah created with Wayne Enterprises’ money are actually bombs. Just then the bomb at his house goes off and Jeremiah lets Bruce know that Jim is dead. Bruce pledges to stop Jeremiah, who responds by calling Bruce his best friend and knocking him out. The episode ends with Jeremiah and Ecco going to Wayne Enterprises. After taking care of some guards, Jeremiah enters a room where he lovingly gazes at many more of his generators. The danger of Jeremiah is immediately apparent. He is Jerome but smarter and more calculated. Jerome’s plans did have multiple layers, but he seemed to need other villains – Scarecrow, Tetch, Firefly – to be able to pull them off. Not Jeremiah, he has already manipulated many just by dressing up as Jerome and can set to the destruction of Gotham by himself. Jeremiah goes from seemingly weak and paranoid at the beginning of the episode to confident and dangerous by the end. Bruce and Jim both know his true self now and can begin to plan how to take him down. On that note, there is no way Jim is dead, so don’t even bother thinking anything of the sort! We’re down to the last two episodes of season 4! We see Jeremiah going to the GCPD and announcing that there will be a new dawn in Gotham. To prove he means business, he blows up the old clock tower. It’s interesting to wonder where his other bombs are, with all that fire power he could level the city! We see Bruce get gassed by Scarecrow which will lead to him having another transformative experience. How many times does Bruce need to go through psychedelic trips before he is fully set on becoming the Dark Knight?